Huge plumes of black smoke were seen rising into the sky from a farmer's field during Thailand's air pollution crisis on April 16. 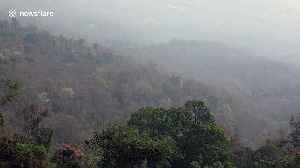 Toxic levels of smog in Bangkok and in Chiang Mai in the north of the country have been felt since February. The problem has been worsened by farmers burning their left-over crops on fields. Despite warnings to avoid the practice of setting alight the dried sugarcane husks to clear the land, farmers have continued to do it. 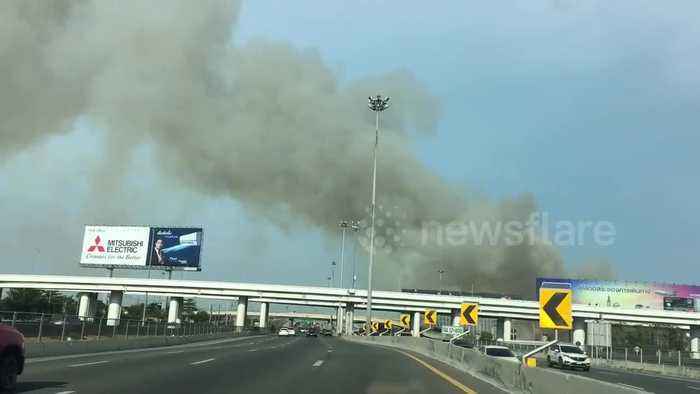 Footage from Bangkok near the Suvarnabhumi Airport shows how the thick smoke can be seen for miles around. Pralong Damrongthai, deputy director-general of the Pollution Control Department, said officials would have to be more serious in asking people to stop burning off fields and forests, and would spray water hourly instead of twice a day in affected areas. At its worst point, the pollution level has reached more than 200 micrograms of PM2.5 particles per cubic metre of air - four times the safe limit of 50. This will cause chronic diseases such as asthma, cancer, heart disease and stroke in the long term if there is exposure to air pollution. Health experts have warned that the pollution is a ''silent killer'' and that at current levels was extremely harmful to anyone stepping outside. They said the cost of treating people could run into ''billions of dollars''.